– The towrope must be taut before driving off. – Engage the clutch very gently when starting to move; on vehicles with automatic gearbox press the accelerator slowly. – The ignition should be switched on so that the turn signals, horn, windscreen wipers and washers can be used. Please ensure that the steering wheel is unlocked when you switch on the ignition, and that it moves freely. – Put gear lever in neutral (manual gearbox) or move selector lever to position N (automatic gearbox). – The brake servo and power steering only work when the engine is running. Considerably more effort is required on the brake pedal and steering wheel when the engine is switched off. 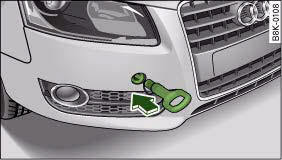 – Ensure that the towrope remains taut at all times when towing. It is easier and safer to tow a vehicle with a towbar. You should only use a towrope if you do not have a towbar. A towrope should be slightly elastic to reduce the loading on both vehicles. It is advisable to use a towrope made of synthetic fibre or similar material. Attach the tow-rope or tow-bar only to the towing anchorages intended for this purpose or. Towing requires some experience – especially when using a towrope. Both drivers should be familiar with the technique required for towing. Inexperienced drivers should not attempt to tow-start or tow away another vehicle. Do not pull too hard with the towing vehicle and take care to avoid jerking the towrope. 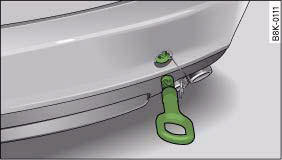 When towing on a loose surface there is always a risk of overloading and damaging the anchorage points. If there is no oil in the gearbox or no lubricant in the automatic transmission the car may only be towed with the driven wheels lifted clear of the road, or transported on a special car transporter or trailer. • Note the regulations concerning towing. • The hazard warning lights of both vehicles must normally be switched on. However, observe any regulations to the contrary. • Make sure that the towrope is not twisted, as otherwise the front towline anchorage on your vehicle could work itself loose. The front towline anchorage is only mounted if the vehicle has to be towed. The screw connection for the towline anchorage is located behind a cover cap on the right side of the front bumper. – Take the towline anchorage out of the vehicle's tool kit. – To detach the cover cap from the bumper, firmly press the lower part of the cap inwards to release it ⇒ fig. 280. – Screw the towline anchorage firmly all the way into the screw connection ⇒ fig. 281. After use, unscrew the towline anchorage and put it back in the toolbox. Replace the cap in the bumper. The towline anchorage should always be kept in the vehicle. If the towline anchorage is not screwed in as far as the stop, there is a risk of the screw connection shearing off during towing (accident risk). Vehicles which do not have a factory-fitted towing bracket* have a towline anchorage on the right side of the rear bumper. – To detach the cover cap from the bumper, firmly press the lower part of the cap inwards to release it ⇒ fig. 282. – Screw the towline anchorage firmly all the way into the screw connection. – Fit the towing bracket. – Attach the towbar or the towrope to the towing bracket. After use, unscrew the towline anchorage and put it back in the toolbox. Replace the cap in the screw connection. The towline anchorage or towing bracket should always be kept in the vehicle. Vehicles which have a factory-fitted towing bracket* do not have a screw connection at the rear for the towline anchorage. • If the towline anchorage is not screwed in as far as the stop, there is a risk of the screw connection shearing off during towing (accident risk). • If your car has a towing bracket*, please use only special tow bars with suitable attachments (i.e. tow bars which are specially designed for use with towing brackets) to avoid damage to the coupling equipment. • If your car has a towing bracket*, please use only special towing ropes (risk of accident). As a general rule, tow-starting is not recommended. – Engage 2nd or 3rd gear before moving off. – Press the clutch and hold the pedal down. – Once both vehicles are moving, release the clutch. – As soon as the engine starts: press the clutch and put the gear lever in neutral. If the engine will not start, it is best to try starting it using the battery of another vehicle before attempting to tow start. You should only try to tow-start the engine if jump-starting is not successful. Tow-starting is an attempt to start the engine via the movement of the wheels. When tow-starting a vehicle with a petrol engine, do not tow it more than a short distance, otherwise unburnt fuel can enter the catalytic converter and cause damage. For technical reasons, it is not possible to tow-start a vehicle with automatic gearbox. There is a high risk of accidents when tow-starting, as the towed vehicle can easily be driven into the towing vehicle. When tow-starting the vehicle, do not tow it further than 50 metres: otherwise the catalytic converter could be damaged. The vehicle can be towed using a towbar or towrope in the normal way, with all four wheels on the road; it can also be towed with either the front or rear wheels lifted off the road. The vehicle must not be towed faster than 50 km/h. Certain restrictions must be observed when towing your vehicle. • Make sure the selector lever is in the N position. • The vehicle must not be towed faster than 50 km/h. • The vehicle must not be towed further than 50 km. The reason for this is: when the engine is not running, the gearbox oil pump does not work and the gearbox is not adequately lubricated for higher speeds or longer distances. If the vehicle has to be towed with a breakdown truck, it must only be suspended at the front wheels. The reason for this is: the drive shafts are located on the front wheels. If the car is towed with the rear wheels lifted off the road (i.e. travelling backwards), the drive shafts also turn backwards. The planetary gears in the automatic gearbox then turn at such high speeds that the gearbox will be severely damaged in a short time. If it is not possible to tow the vehicle as described above, or if it has to be towed further than 50 km, it must be transported on a special car transporter or trailer. • The vehicle must not be towed further than 50 km. The vehicle must not be towed with the wheels lifted at either the front or rear.